In the never-ending quest to simplify my life, I am always hunting for good dinner ideas -- dishes that will be easy to prepare and will last us at least a couple of meals. I was intrigued by the thought of serving up enchiladas after receiving a daily email recipe suggestion from AllRecipes.com. I searched online for vegan enchilada recipes. Recipes looked simple enough and I have really taken a liking to Daiya Vegan Shreds, which are free of the top 8 allergens and melt like real cheese!! (If you deal with milk allergies or are vegan, you understand how much sheer joy meltability brings. Daiya really is in a class by itself here.) After a couple of failed attempts at tortilla-rolling -- I'm guessing my corn tortillas were way too small and just not glutinous enough-- I decided to ditch the rolls. I abandoned good form and just focused on figuring out how to enjoy all the ingredients. And there, the enchilasagna was born! Are You Prepared for Day Camp? We live in San Francisco. 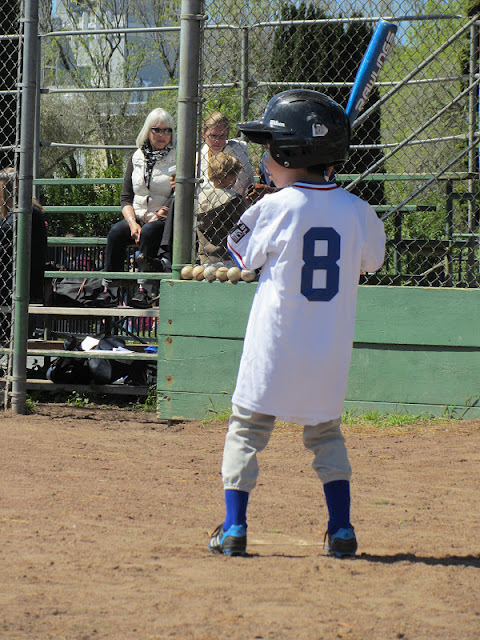 And like snagging a decent parking space or getting into a reputable preschool for your tot, finding and enrolling in a camp that works with your kids' busy schedule can be tough. Crazy, right? And yes, I've had all three kids scheduled in camps from ballet and basketball camp to baseball and art camp for the entire summer since February. Now it's May, and public schools let out this Friday (gasp! ), which means camps are right around the corner! 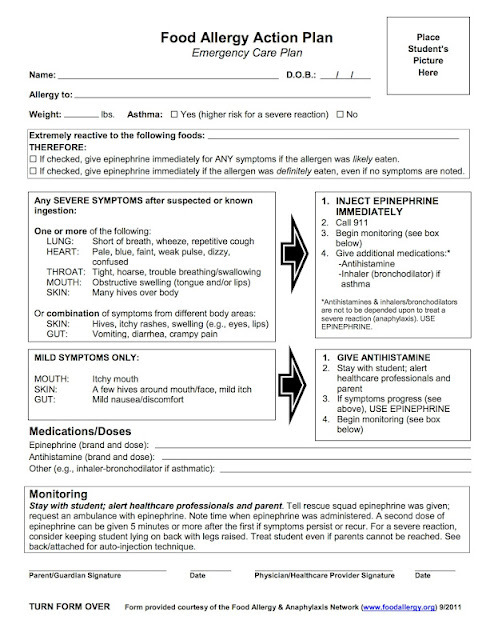 Arriving on the heels of Tristan's latest severe allergic reaction, I am reassessing my allergy guide for camps to make sure they have everything they need in the case of a reaction. There are two times during the year that I put together my resources for the purpose of educating caretakers: before summer camps, and again in the fall before the new school year. Having things in order before camps begin are even more crucial than school for two reasons: many of these camps travel or take place off site, and many will last just a week or so, giving you no time at all to form a trusting relationship with the staff to ensure that they are properly trained to prevent and treat an allergic reaction. So I've decided to streamline my resources for the purpose of an at-a-glance guide for you and for summer camp staff. If I have just a few minutes with them before the start of the first day, here's my to-do list complete with plans and templates for you to personalize for camp staff this year--keeping it clear and simple! Inventory all of your child's medications, putting aside any expired Epipens, and discarding any other expired medications. Go out and stock up so you have a set of meds for your child's pack, for your bag, and for the home. Our allergy kit includes Diphenhydramine (Benadryl) chewables (generics can be found at Target), Loratadine (Claritin) chewables (generics at Target or Walgreens), Naphcon A allergy drops, and an Epipen Jr. twinpack. Keep everything in their original boxes, and make sure that the Epipen Jr. has its original label on it, with the prescription in your child's name. On day 1 of camp, bring an expired Epipen Jr., and let your child's counselor, who has likely zero experience with an Epipen, administer it on an orange. Sounds funny, but my children's allergist recommends it. If a caretaker can get over her fear of using an Epipen, there is a higher chance she'll use it when she needs to. If you don't have any expired Epipens, the trainer pens will do. 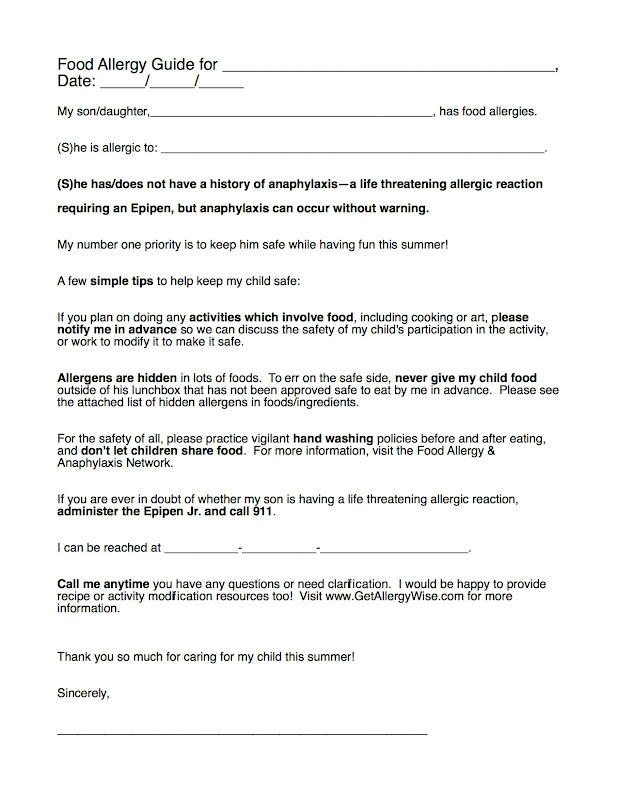 Update your Food Allergy Action Plan and have it in hand along with your child's medications to discuss with camp staff on day 1. As you can see, you will need two doctor's signatures on your Action Plan. 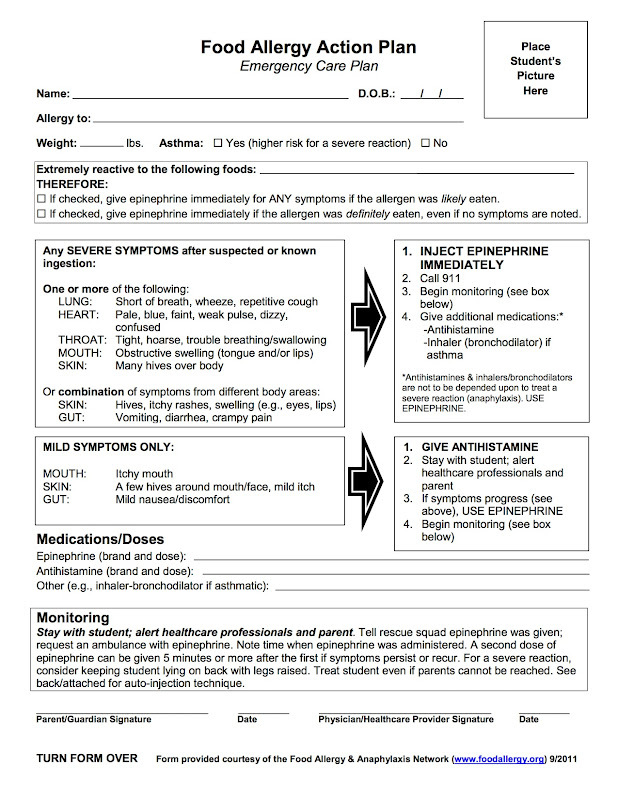 Some places will require these signatures in order to keep and administer medication to your child, so try to get them to your allergist or pediatrician as soon as possible. In a best case scenario, set up an appointment with your doctor to go over the plan and discuss other concerns you have. Make copies and have a scanned copy in your computer just in case. When school rolls around, you'll have it ready! 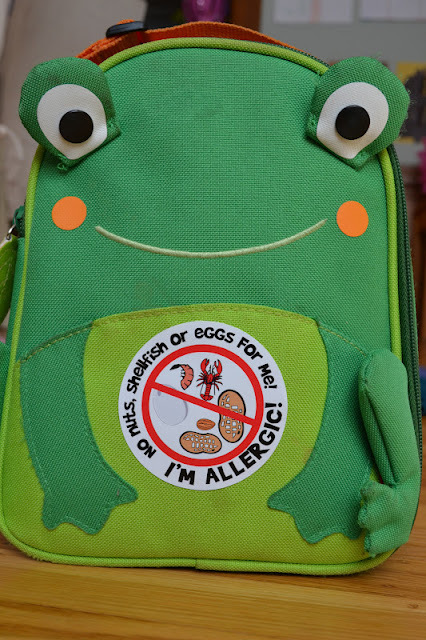 Label your child's lunchbox, water bottle, food containers, and backpack with personalized Allergy Alert Stick-Ons. 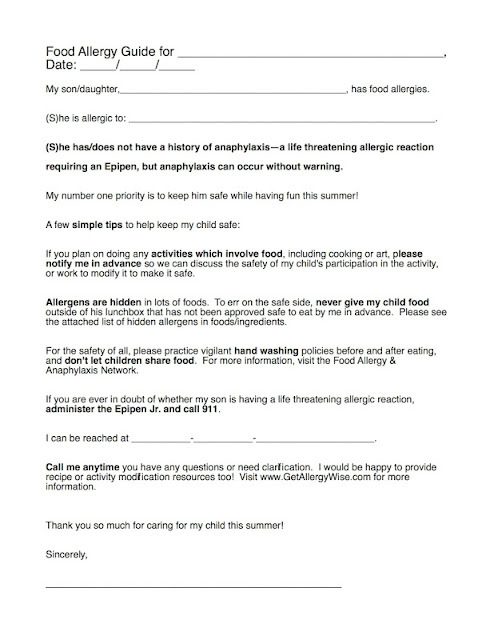 These are quick and easy references for camp counselors, with bold lettering and pictures of your child's food allergies, especially good for children with multiple food allergies, like mine. 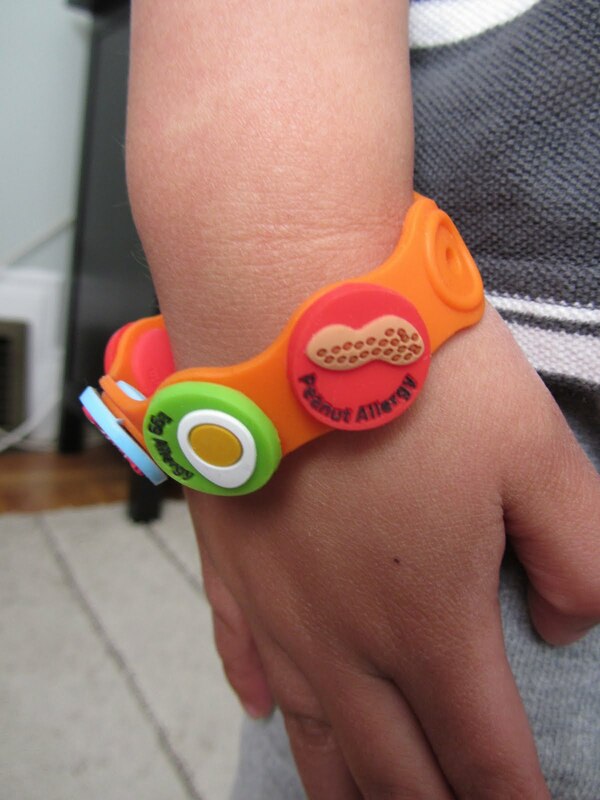 Equip your child with a food allergy bracelet, like this customizable Allerbling bracelet, to remind others of his food allergy. Keep your cell phone charged and on. It will provide you some peace of mind while your kids are at camp. Sit back and enjoy the foggy days of summer, knowing your children are in good hands! For more food allergy resources, see Irene's recent list compiled in celebration of Allergy Awareness Week. Congratulations to Stefanie Ng and Marisol Romo! These new GAW readers will be receiving a copy of Juniper Skinner's Food Allergies and Me or Sandra Beasley's Don't Kill The Birthday Girl. More than a year ago on Facebook, Michelle T. mentioned that she was making butter chicken, a popular Indian dish, from scratch. Desire immediately struck me -- I hadn't eaten butter chicken in such a long time! If you aren't familiar with butter chicken or murgh makhani, it's a dish of tender pieces of chicken drowning in a creamy, spiced sauce. (Starting to crave this again as I type!) With yogurt, butter, ground nuts, and peanut oil being common ingredients in Indian cuisine, our family has never been able to buy safe Indian food. But butter chicken sounded so good at that moment that I just had to figure out a way to make it immediately! There are a lot of different recipes for butter chicken out there. All of them use garam masala, a dry spice blend. (You can make it yourself with this recipe or buy it ready-made from an Indian market.) Some recipes call for marinating your protein with tandoori masala before cooking. The origins of butter chicken are not known for sure but some think that the dish was created by accident when a king's cook accidentally created a creamy sauce to go with leftover tandoori chicken. After some online recipe sleuthing and testing, changing, and more tinkering with a couple of good contenders, I came up with a recipe to our liking that suits our need for dairy-free/nut-free eating. I always sneak sliced mushrooms and peas into the sauce to get more veggies into my little guys. Steamed potato chunks are a good addition, too! Soy Dream Original is my first choice for cooking. It doesn't have an overpowering sweetness or vanilla taste when cooked. Unsweetened plain soy milk (not vanilla) would work fine, too. I serve this with rice (brown rice, jasmine rice, basmati rice, whichever) and Trader Joe's naan. Unlike traditional naan or other naan in mainstream markets, Trader Joe's versions are dairy-free. They do however use eggs and wheat and, truth be told, they aren't as awesome as real naan...but for my milk-allergic and nut-allergic kids, it is good enough for us! Pita and flatbread might be good alternatives, too. I recently started using extra firm tofu in place of chicken. I cut one package (about 14 ounces) of the tofu into chunks and gently toss it in the marinade before refrigerating. Still delicious! Combine cubed chicken breast, tandoori masala, soy yogurt, oil, and lemon juice in bowl. Season with salt and pepper. Marinate chicken in refrigerator. The flavors really settle in if you can do this for at least 6 hours. When you are ready to make your butter chicken, prepare tomato puree in your food processor. Set aside. In a large saucepan, heat cooking oil over medium heat. Add onions and cook for 2 minutes. Add chicken. Stir chicken and onions occasionally. Once chicken in thoroughly cooked, add mushrooms to the pan. Cook for 5 minutes. Add vegan margarine, masalas, brown sugar, ginger, garlic, and lemon juice. Stir until margarine melts. Add tomato puree and 1 1/2 cup soy milk to the pan. Stir corn starch and 1/2 cup soy milk until there are no lumps. Add that mixture, too. Stir frequently to ensure even thickening and no lumps. When the dish starts to bubble (boil), check if you like the consistency of the sauce. If the sauce is too runny, add a mix of 2 Tbsp of soy milk plus 1 tsp of corn starch. Taste test. Add salt as needed. Sometimes I sprinkle in more grated ginger, garlic, tandoori masala and garam masala to deepen the flavors. Add 1/2 cup of frozen peas and simmer an additional 5 minutes until peas are thoroughly heated. Serve your butter chicken with rice and/or toasted naan. Delicious! Thanks, Michelle T. for the inspiration! with food allergy clothing. Quite distracting. It's Food Allergy Awareness Week, a time to promote awareness about food allergies. We all know someone with food allergies. And of course we know many more people who have no food allergies at all. This week, dedicated to awareness and education, can be especially important for those people who are unfamiliar with food allergies or unconvinced by seriousness they pose due to a lack of first-hand experience. 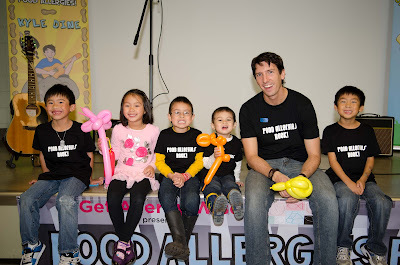 There are so many ways, active and passive, to increase education about food allergies. 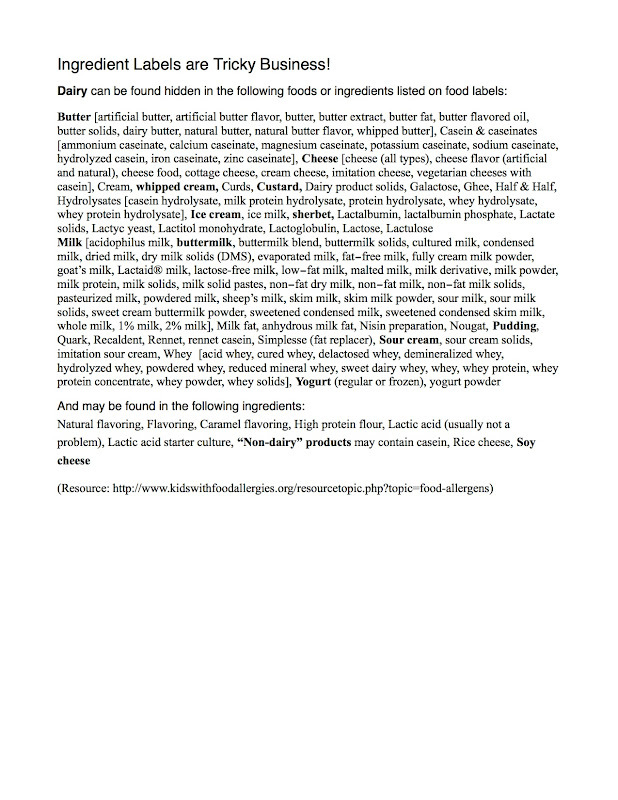 We are so lucky in this era of the internet that there is tons, TONS of information on food allergies available to us. What I have found most effective are videos of kids and parents living with food allergies. Hearing first-hand accounts of allergic reactions, anaphylaxis, and the social and emotional stress that food allergies put upon kids and their caregivers is heart-wrenching. As a food allergy mom myself, I cried hearing parents speak about their greatest fears. They are my greatest fears, too. Share these videos with your friends and family. "Wearing" your food allergies can be the easiest way to start a conversation about food allergies. I can think of several moms that I now call my friends who approached me after seeing Ryken's and Callan's allergy alert bracelets or their Food Allergies Rock t-shirts. STATKids Health ID wristbands - bright red silicone alert wristbands with contrasting white writing. Allerbling Bracelet - bracelets with customizable allergen alert charms. 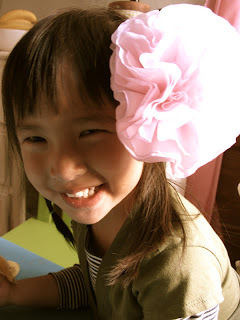 Alert Clothing - cute apparel designs for preschool-aged children. Allergy Apparel - hip designs for alert t-shirts, bracelets, and Epi-Pen and inhaler carriers. Medical Alert - classic and traditional metal medical alert jewelry. They offer annual memberships that would ensure that your child's complete medical information is available to first responders and hospital staff in times of emergency. So very fond of our bright STATKids wristbands! Nothing sticks to the brain like a catchy tune. 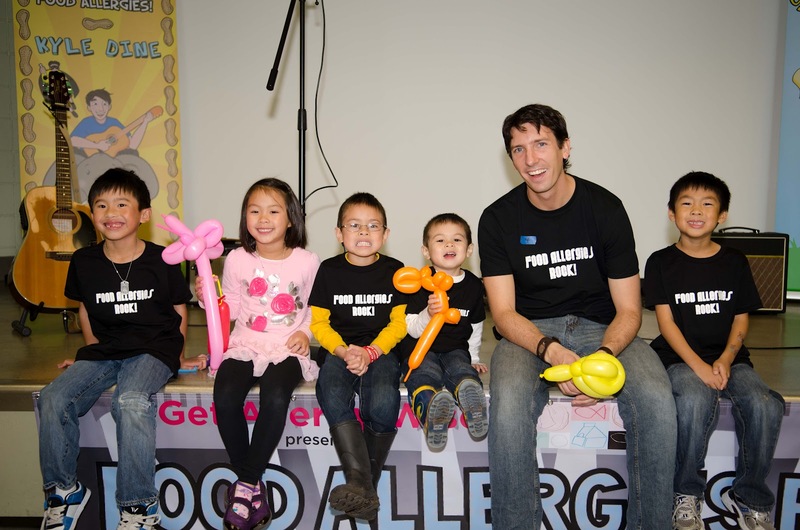 And thankfully, the first ever food allergy musician Kyle Dine has shed light on food allergies in a fun and kid-friendly way. Kyle has written songs about pride and inclusion/exclusion. And many of his tunes are great teaching aids about Epi-Pens, the top 8 allergens, and safety tips (I'm thinking of "Stop! Please Don't Feed Me!" and "Able to Read a Label"). We at Get Allergy Wise are such big fans of Kyle's music that we hosted his premiere Bay Area performance last November. If you have never heard Kyle's music, you can listen to many of Kyle's songs in full at his website or short samples of his two children's albums, You Must Be Nuts and Food Allergies Rock on Amazon.com. Kyle Dine hangs out with some happy fans before his Bay Area performance. Sometimes the most effective way to share about our food-allergies "world" is through the written word. Books that provide concrete images of allergic reactions and safety measures can help young readers understand. And adults can benefit from written anecdotes about emergency room visits, risky teen behavior, and parent-child conflict -- topics that resonate with them, allergies or not. We've compiled a list of helpful books to educate and open up discussions about food allergies. Check with your local library to see if it carries copies of these books. If these titles are nowhere to be found, think about buying your own copies. You may buy directly from the publisher or author, or through Amazon.com. (Remember to use this Amazon.com Kids With Food Allergies link to earn money for KFA!) Then, lend a hand to food allergy awareness by sharing your favorite titles with the libraries in your lives. Recommendations are often greatly appreciated as librarians are constantly reviewing tons of newly published books and ordering new materials for their library collections. Become a new Get Allergy Wise subscriber. "Like" our Get Allergy Wise Facebook page. Share this post or our Facebook page with your FB friends. Contest ends on Sunday, May 20th, at 8pm. Winners will be announced on our blog and FB page on Monday morning. Prizes will be mailed directly to our lucky winners after Sarah recovers from her kids' dance recital extravaganza! Cooking spray is a tool that is probably found in most everyone's cupboards. If you use nonstick pans or like to bake, oil mists like Pam are convenient ways to prepare your kitchenware without adding on a lot of extra oil. 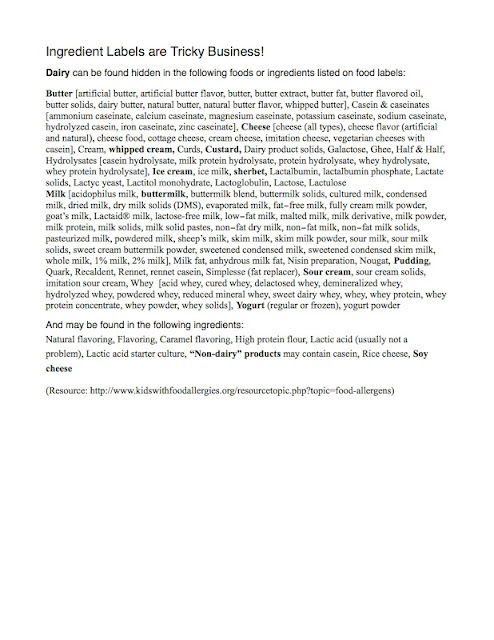 But read the label of almost any cooking spray and you will find soy lecithin listed as one of the ingredients. For people with soy allergies, this won't do. Thank goodness for options like Misto Gourmet Olive Oil Sprayer. The Misto allows you to make your own soy-free can of cooking spray. To use it, fill the can no more than halfway with oil, pump the top down to fully pressurize the can, then remove the top and spray. It is advised to unscrew the cap after each use to release air pressure that might clog the nozzle with oil. While the product is advertised as an olive oil sprayer, my Misto sprayer worked well with extra virgin olive oil at first, but then got clogged after a couple months of use. The oil would no longer mist but would simply drip out of the nozzle. After reading through more Amazon reviews, I found a few others had similar issues and recommended against using EVOO because its thick consistency may be too much for the spray to handle. I wish I had found those comments sooner! Thankfully the Amazon reviews are also a handy spot for solutions. Readers suggest unclogging nozzles by emptying out all the oil and pumping a half vinegar/half hot water solution through the system. My Misto somehow cured itself over time -- after more than a month of non-use, I pumped down on the cap to create air pressure again, and voila! My awesome little misty friend is back in action! Perhaps gravity helped to unclog the nozzle over time? Cooking spray helps to minimize added fat in light recipes such as these baked falafels. If you are looking for a cooking spray but need it to be soy-free, Misto might be a good alternative for you. My experience with Misto is mixed but tons of people on Amazon are fans. It's very possible that the extra virgin olive oil was the culprit in my cloggy situation or that I had slightly overfilled the can with oil. My advice would be to follow the directions carefully and, if possible, opt for a lighter cooking oil in order to avoid nozzle troubles. I definitely think it would help Misto users if the product had a line drawn inside the can to clearly indicate where you should stop filling with oil. Seeing as Mother's Day is a few days away, we're going to keep things simple this year. I started to think about what I would really like to do or have for Mother's Day, and came up with a few ideas that any husband-led band of kids should be able to achieve. And truly, guys, we love stuff that comes straight from the heart. 1. Pack a picnic. Um, just to clarify, packing a picnic...requires much more planning than going on a picnic. This weather we're having (early Indian summer, please stay with us...please please please!) just screams picnic, but somehow, well let's face it, I am always the one to pack the picnic foods. Got to have everyone's favorites--soybutter sandwiches, no jam on this one, cut in triangles not squares, etc. If just for one day, I could sit back and enjoy the meal without the chaos that is sure to ensue in the minutes before screaming "Shoes on everybody now!" that would make for a pretty special Mother's Day. Just sayin'. 2. Family Portrait. It doesn't get much cuter than this. Have your kids draw family portraits using bright markers, oil pastels, or a combination of markers and watercolors. Put a frame on it for an added touch. If all else fails, any piece of original artwork will be much loved. 3. Breakfast in bed. Classic. I guarantee you, this never gets old. Have your kids design a menu of items that will be served. Let older kids pour the milk, cereal, and juice, have little kids pull out plastic plates or trays. Try yogurt parfaits or fruit smoothies for an easy, healthful option. After sleeping in a few hours, mom will be hungry. 4. Family Tree. Create a family tree and have your kids add names, draw pictures, or glue on photos. 5. Video. Compile all of that video you have of the kids and create a simple movie. Mom will be reminded of how it's all worth it. 6. Acrostic. 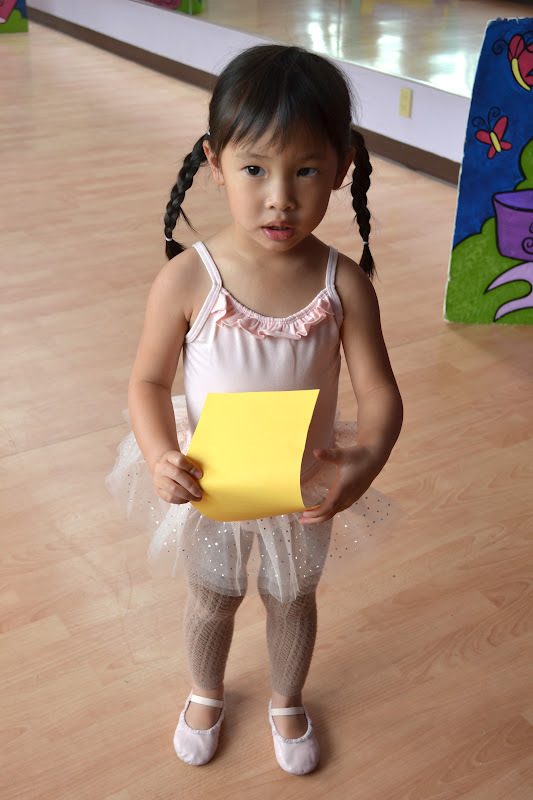 Spell "Mommy" down the left side of a piece of paper and let older kids fill in a poem about mommy. 7. Clean. Clean up a part of the house that is notoriously messy or cluttered. She won't even mind being awoken by the sounds of the plates clattering or the vacuum roaring! 8. Coffee Filter Flowers. Last year we made tissue paper flowers for the moms in our lives, and this year I wanted to try these coffee filter flowers. To make them a bit more kid-friendly to make, I used scotch tape to attach the top and bottom coffee filter to a cake pop stick, and cut a slit through a layered batch with a scissor. 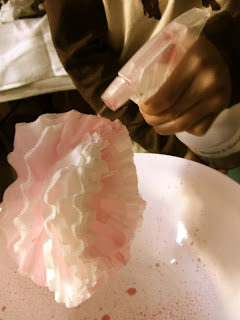 The kids had fun scrunching and squirting a water/beet juice mixture with a spray bottle. Just be careful! 9. Gift Ideas. It's rare that my husband and I agree on what a romantic, lovely, useful gift looks like. It took some thinking, but here are my picks for those of you who feel you must go out and buy something. Hey, nothin' wrong with that! Jane Iredale Sugar & Butter. A lip exfoliator/lip balm all in one. Organic brown sugar on one side exfoliates, while the tinted lip plumper moistens and gives a bit of shine. Gluten-free, but contains macadamia nut oil. Keurig Single Cup Brewing System I don't understand how I ever lived without my new coffee maker. Brews one cup at a time, so the babysitter, mother-in-law, or any visitor can have a cup of freshly brewed coffee in minutes. Silpat Silicone Cookie Sheet Liners In lieu of parchment paper, it's a fantastic pan liner for baking cookies every time. I use it to roll out dough, too, and it's perfectly nonstick. Skip Hop Central Park Blanket and Cooler Bag. The creme de la creme of picnic blankets. Water resistant, folds up with carrying strap, and comes in super cute colors. Comes with a cooler bag now. They've thought of everything, haven't they? Takeya Classic Glass Water Bottle in fuchsia and black. Not only does it looks awesome, will hydrate you throughout the day (and you know how dehydrated us moms get! ), it's made of glass so no more chemicals with my water, thank you very much. Comes with a cool silicone sleeve in a variety of colors. Fillmore Bake Shop Macarons I try not to rope myself into falling in love with too many sweets shops that sell stuff that none of the kids can eat, but a girl has to have her sinful delights (all kept in my top cabinet, above the fridge). My lovely sister-in-law (thanks Theresa!) brought a box of these over to me the other day, and they were absolutely heavenly. Aaah. So many flavors, so little time. The key to winning mom's heart on Mother's Day is to remember that you've already won her over. But being extra thoughtful and kind to each other will really make her day. Happy Mother's Day ladies! Enjoy! I love homemade gifts for Mother's Day. I gladly pass on flowers and boxes of chocolates in favor of home-cooked meals (not made by me of course! ), kid crafts, and cards...I love all the thought and effort that goes into making the day a special one for me. And besides, my kids usually can't share in the chocolates due to their milk and nut allergies and flower pollen often sends me into a sneezing, eye-rubbing spiral! A Mother's Day flower gift without the pollen! My kids love to make cards and "books". Cars, dinosaurs, Batman, and Angry Birds seem to be their subjects of choice lately and they usually just use pencil, markers, scissors, and the occasional puffy alphabet sticker. For Mother's Day this year I wanted to introduce a new kind of technique they could use for making cards so that they will have more crafty ideas for the future. For the past month at preschool Callan has been studying mosaics. The kids there have been experimenting with different textures, shapes, and materials to create pictures. Some kids have approached their mosaics with a definite plan on what they want to make, and have been drawing with pencil and filling their pictures completely to make their mosaics stand out. I decided that making paper mosaic pictures would be a beautiful way to decorate a Mother's Day card while also reinforcing the techniques taught in Callan's class. Ryken and Callan were excited to try the art project. Each step was challenging -- especially their first task of making a drawing big enough to fill the page and simple enough to be able to create a distinct picture. The kids had to draw and erase a couple of times before they came up with good-sized drawings. 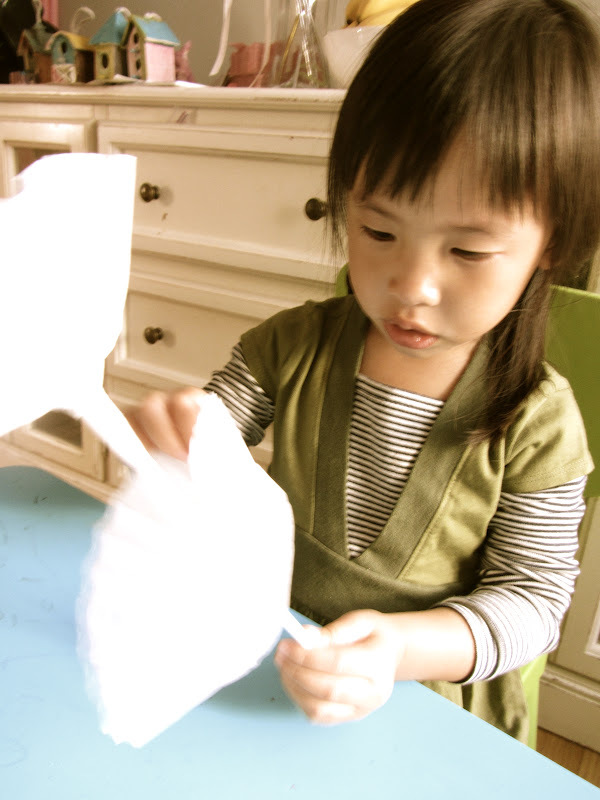 Tearing the papers into small pieces proved to be difficult for the kids. They risked losing interest (especially Callan) so I had them choose the colors and magazine pages and I tore up pieces for them. Callan (age 4) was ready to quit on his mosaic pretty early on. The kid just wants to draw cars all day! The novelty of mosaics wore off fast and he was back to just paper and pen and car drawings once again. Ryken (almost 7), however, was really interested in the task. He wanted to make a Star Wars card but with a Jedi mindtrick of my own, I convinced him to make a simpler design that didn't require face, hair, clothes, lightsaber, and body. I wasn't able to persuade him to make a Mother's Day-friendly flower or heart card, though as he finally decided on an Angry Bird. The cards came out better than I expected! They loved being able to incorporate their drawing skills in the card. The kids were so fond of their mosaics that they wanted to keep them instead of sending them as Mother's Day cards. We got around that by taking lots of pictures and promising the kids we would include a note in grandma's card to ask her to display them so we can see them on our next visit. Fold and cut 8.5"x11" white paper in half to create two 8.5"x5.5" sheets. Choose a 9"x12" cardstock paper for the background and fold in half. Apply a thin layer of glue just along the edges of one 8.5"x5.5" sheet. Adhere to one side of the cardstock. The white paper will be your canvas for your paper mosaic. Lightly draw a simple picture on the white paper. Have your child draw something that fills up most of the page. It may help kids to use another sheet of paper as a draft so that they can fiddle with their drawing and figure out how big it needs to be. After your child has his/her drawing, talk about the colors that they will need to complete their art. Look through magazines and old colored papers for colors and patterns that can be used for the mosaic. If you are going to be doing something in red, look for a few different shades or patterns of red. Variety adds interest to the mosaic. Tear the pages and papers into small pieces. (We tried to make ours about as big as the kids' fingernails.) For ease of use, group similar color pieces together. Spread a thin layer of glue over a small section of your drawing. Stick paper pieces one at a time on to drawing being careful to stay just within the drawing's borders. Glue pieces close together or slightly overlap them so that the white paper underneath is completely covered. Continue to glue paper pieces on to the drawing one small section at a time until you are finished. When you have filled your whole drawing, double check to make sure all pieces are glued flat. Dab with more glue if needed. Once glue has dried, you may want to put the finished cards beneath a stack of heavy books overnight in order to flatten them. Glue or any wet substance (like watercolor paints) can warp paper. After you have flattened the cards, write your message to your special someone! I'm thinking of helping the kids make torn paper mosaic self-portraits such as these. I think they would be pretty neat gifts for the family! presented to you by my proud husband. With Mother's Day coming up, I wanted to share a recipe that is so sinfully rich, it's perfect for spoiling those special someones in your life. Do you like Samoas but have to skip them due to food allergies? The magical coconut cookie bar is the answer to your prayers! This dessert is all about chocolate and coconut plus it's a simpler substitute for homemade Samoas. I made these once and thought they were so easy that even the non-cooks of the house can whip these up. I had to know for sure, though, so I asked my husband if he would mind a batch for blog research sake. Aside from scrambled eggs, my husband hasn't cooked much since we got married. He graciously agreed. I had written down an abbreviated version that was just fine for my own use. However, for my non-baker husband this shortcut didn't cut it. He had a lot of questions and felt that I needed to flesh out all the steps if I really wanted to sell this as a recipe that "anybody could make". So instead of rewriting the original recipe in its entirety with a few of my substitutions, I will simply provide you the link to Isa Chandra Moskowitz's recipe here at her Post Punk Kitchen blog, where Isa includes very detailed instructions for each step. We easily made a couple of substitutions. My first batch was gluten-free using finely crushed gluten-free graham crackers. In my husband's batch, he used Honeymaid graham cracker crumbs and substituted coconut oil in place of Earth Balance. And as our kids have various nut allergies, we omitted the nut layer altogether in each of our batches. Earth Balance and Honeymaid graham cracker crumbs instead of GF graham crackers. I made a batch last week with gluten-free, dairy-free Kinnikinnick's Graham Crackers (gluten-free, dairy-free, egg-free, nut-free). Kinnikinnick also sells allergy-friendly graham cracker crumbs. If you need soy-free and dairy-free graham crackers, you can try New Morning Honey Grahams. I haven't been able to find a gluten-free and soy-free graham cracker in stores but you can check out the recipe on the blog Dandelions on the Wall. I haven't tried the recipe but the results sure look like the real thing! Remember to check your margarine and semisweet chocolate chips to make sure they are safe for you. You can skip margarine altogether and use coconut oil just fine. If you want a vegan margarine, Earth Balance offers varieties that are dairy-free and one in a red label that is dairy-free and soy-free. We use Trader Joe's which are dairy-free; Enjoy Life semisweets are free of the top 8 allergens. After a little clarification on a couple of steps from my handwritten recipe, my husband got to work. I spent my afternoon reclining on the sofa as he was busy in the kitchen. While I would love to tell you that I was treated to a pre-Mother's Day relaxation break, my real reason for kicking back was that I had a little accident. To make a long story short, I think I may have broken my little toe so I was getting my RICE on. The resulting coconut bars were decadent. My husband did think this was a pretty easy dessert to make. Our kids thought this second batch tasted even better than my first batch. Why? Because their daddy had made it! Scrumptious, allergy-friendly, and so easy that my non-cooking partner can make them. You see the magic now? Can you feel Callan's excitement? patient enough to wait for them to set. We don't mind eating with forks! If you like this recipe, check out Isa Chandra Moskowitz's recipe book Vegan Cookies Invade Your Cookie Jar. Read our review here or check out those 100 five-star Amazon reviews! Among the cookie, brownie, and bar recipes are my favorite lovely chocolaty crinkle cookies and other winners. Present a plate of cookie bars (and the recipe book!) to that favorite allergy mom in your life next Sunday! I let my guard down. And that's easier said than done when you have food allergic children. Normally, you find yourself wound up so tight it hurts. But boy, was I feeling confident. Especially after our successful Disneyland trip, which included two sit-down meals at the theme park, a meal at a Vietnamese restaurant, and a take-out picnic courtesy of El Pollo Loco. Yes, I was riding high. So I only hesitated for a few fleeting moments when I went to grab a hotdog for each of my children at a school picnic over the weekend. I had even sort of forgotten about the chicken tacos I had packed for my oldest, and most food allergic child. Hey, everything looked harmless. Hotdog--no bun, no beans, no condiments...just a plain old dog. I didn't even ask the caterers about the dogs, and even if I did, it was likely the servers were unsure of their ingredients, I thought. Tristan was famished after exploring the adjacent creek for nearly two hours, where the kids were discovering and consequently throwing into the creek various stones, twigs, and other slimy and unusual specimens with much delight. He gobbled half the hotdog down in about 30 seconds when he started complaining of the hotdog being "spicy." I gave him some juice and a Benadryl immediately. About a minute later, a stomach ache, to which I responded by leading him into some bushes to allow him to vomit. Some of it was out of his system, a small victory, but then again so was the Benadryl I had just given him. He still had a sore stomach, and his face and lips were showing signs of swelling. Fortunately, another mom (who is also a doctor--my saving grace! ), came over to help assess the reaction. We gave him another dose of Benadryl, waited a few minutes, and as the swelling became more apparent around the cheeks and lips, the Epipen came out. Now last summer, the first time I administered the Epipen, I was no doubt as nervous as Tristan was when I realized he was experiencing anaphylaxis. This time, I was a seasoned pro, but it was Tristan who could anticipate the pain of the needle, with the memory of the first shot clear as day flooding back to him. He was writhing and screaming, "No, please...no!" Without the comforts of home, this made for a tense situation. With the help of the other mom holding down his leg, in went the needle in one swift motion, and ten seconds later, some relief that we had bought some time for us to get Tristan to the ER. With the Doyle Drive closure, this was the worst weekend we could've picked to be across the Golden Gate Bridge. But thankfully in the car, Tristan's swelling seemed to stabilize, and we got him to the ER, where they monitored his condition and his stats for about an hour and a half. By then, he looked much better, and seemed to be feeling much better, requesting the DVD binder, ready to select one for his viewing pleasure. I let my guard down. And this is going to happen to the best of us. The balance between constant worry and stress over everything that goes into our kids' mouths and the rare feeling of control over our children's food allergies is ever so delicate. The most important things are to keep our wits about us, always be prepared with our Epipens, and handle each moment as it comes. Because this is our life. And even though we may face scary, uncertain, challenging, nervewracking moments, we must remember we are good moms with good instincts. We will face bumps in the road, but it's how you navigate over them that puts you back in the driver's seat, calm and ever vigilant, when the smooth road lies ahead. It was quite a relief to see this smile again!